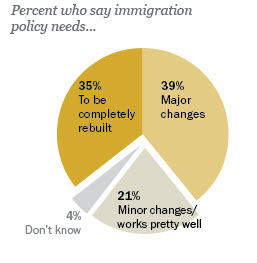 Americans strongly believe that the nation’s immigration system is due for an overhaul, but that widely-held view is not matched by consensus on how to deal with illegal and legal immigration. Three-quarters (75%) say they think the system needs at least “major changes,” including 35% who say it needs “to be completely rebuilt,” according to a Pew Research survey in May. An immigration reform bill that would mark the biggest changes to the nation’s immigration system in decades passed a key hurdle on Tuesday when the Senate Judiciary Committee voted to send the measure to the full chamber. The bill would create a path to citizenship for the nation’s estimated 11.1 million undocumented immigrants and expand the number of high-tech visas available to foreigners. It also includes measures to improve border security. The Senate is expected to vote on the bill in June. When it comes to legal immigration, relatively few (31%) among the public say the current level should be kept as it is, but there is no consensus as to whether the level of legal immigration should be decreased (36%) or increased (25%). Improving border security also remains a priority, especially among Republicans. Half (53%) of Americans say there is a lot more that the government can be doing to reduce illegal immigration at U.S. borders. Among conservative Republicans, 68% percent say the government can do more at the border compared with just 37% of liberal Democrats.